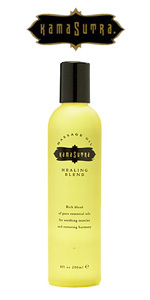 Kama Sutra Healing Blend Massage Oil - When mind and muscles are weary, try a little tenderness with a silky massage oil drenched in healing herbs. Kama Sutra Healing Blend Massage Oil KS10022 - This enchanting formulas have been infused with pure essential oils, artfully blended for an enticing fragrance and a powerful effect on mind, body and spirit. Fortified with skin-nourishing Vitamin E, each non-greasy oil has been highly sought after by massage professionals world wide. Kama Sutra Healing Blend Massage Oil Flavor Description: Rich blend of pure essential oils for soothing tired muscles and restoring harmony. Essential oils include: lavender, cardamom, rosemary, marjoram, elemi, clary sage, black pepper, clove, nutmeg, juniper and pine. Tingling, tasty gel created for men and women to excite desire and heighten sensual pleasure. Impart a stimulating and refresing sensation on any part of the body. This newly formulated emollient imparts a tingly sensation that helps prolong a mans powers long into the night, while giving his partner more to hunger for.